The name Antique Beat was originally coined to describe the music of the English Pop Art Pop retro-troubadours The Real Tuesday Weld. 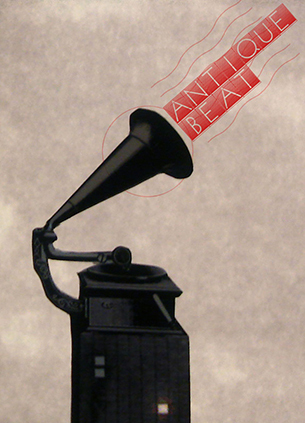 Antique Beat was set up by Stephen Coates, aka The Real Tuesday Weld, and Nix Stewart in 2008. We are an independent Arts Label who publish and produce MUSIC, EVENTS and a variety of bespoke collaborations in unusual locations. The Antique Beat Boutique is our online shop selling exclusive music, stationery and clothing from both our own collection and those of The Real Tuesday Weld. In addition to Salon for the City, our recent productions with our friends and co-curators A Curious Invitation include 32 Londoners on the London Eye, The London Month of the Dead, Alway Print The Myth at the V & A Museum and Salons at Cafe Royal. Contact us if you would like further information on our products, licensing, shows and or artists. Subscribe to our monthly NEWLETTER for free gift, news and exclusive offers. And if you like what you have read please share Antique Beat with your social networks.